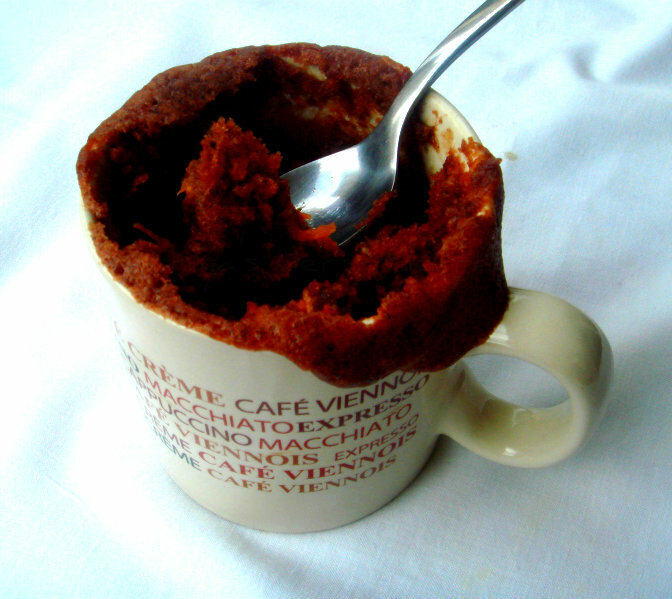 Mug cakes, these single serving cakes will definitely satisfy your sudden sweet cravings. I do prepare quite often these mug cakes for my kid's evening snack, as these cakes are really very quick to prepare.Yesterday i prepared this fabulous chocolate and carrot mug cake as eggless version for their evening snack. You can make this simple and quick mug cake with anything and your cake gets ready easily anytime of the day whenever you feel like having this cake. As my theme for this week's blogging marathon is kid's delight-healthy makeover,i used whole wheat flour,olive oil along with finely grated carrots.My kids enjoyed thoroughly this fabulous,super spongy cake.Check out the marathoners running this 22nd edition of blogging marathon here.Sending to Kid's Delight-Healthy Makeover guest hosted by Rasi, event by Srivalli. Take all the ingredients in a bowl and whisk together as a smooth batter. Fill half of the coffee mug with this prepared cake batter. You can prepare two medium sized mug cake with this batter. Cook in high power for 2 minutes. Take care not to overbake otherwise your cake will turns rubbery. Looks yummy Priya. Love the use of carrots. very good snack for the kids..priya , I really love the simple yet yummy recipes you post! This is such a wholesome bake..perfect for kids' snack time..
Am I your first commentor? I was just about to call it a night...so late here when I noticed on my blogroll list your yummy mug cake, made in the microwave? Wow! that's so incredible, and the ingredients I always have on hand. A quick satisfying dessert cake...just for one! That's surely, for ME! My son loves mug cakes..this 2 minute cake is awesome..
Yum! And I like the cup, real comfort chocolately food! Wow..A very helpful recipe for me.Thanks Priya. Carrot makes it so healthy..yummy.. I get to know so many new recipes from you priya! iam glad about it. Cake looks delicious. You are tempting me to make one right now :). Fabulous ! yummy and not so guilty! perfect! Feast of Sacrifice Event - Received entries updates posted .Please check. Results soon. wow looks so yummmy..something new to me...thnx fr sharing :). YUmmy and delicious one !! love the idea of carrots !! wow.. choco and carrot.. sounds very interesting..
Lovely cake and making it with wheat flour, carrots is so healthy. Delicious and guilt-free. wow the addition of carrots should make it so soft and moist!! well done priya!! Nice addition with carrot, I adore mug cakes. Wow, what a great recipe! So easy and healthy too! Are we supposed to do it together for two minutes or separately for 2 mins each? Also can I replace canola oil for olive oil? Ilove2shp, everything should be done together in two minutes.. Sure u can replace the canola oil with olive oil.